Using large conference calls for business has become prevalent due to its convenience and cost-effectiveness. Moreover, with the right features, these calls can greatly boost your company as it gives you the ability to reach more people via announcements and seminars. It also gives you the opportunity to effectively hold meetings with your remote employees without having to spend too much money and time. Quality – Knowing how to host a conference call won’t matter if you have bad audio quality. High-profile business calls usually cover a lot of important information so it’s vital that participants are able to understand what is being discussed. Make sure that your conference call provider has the newest hardware and software technologies to ensure the highest audio call quality possible. Reliability – Having a reliable call service is important as this ensures that your conference call will go smoothly with no issues. These issues can either be poor connection, damaged equipment, or call interference. Your provider should be able to troubleshoot immediately at any given time and resolve any issues that occur in order for the host to confidently facilitate a call. Security – As the demand for conference calls increases, so do the risks that go with it. Call security is one of the main concerns that a company has. Therefore, having features that prevent data theft or unwanted guests is extremely necessary. Look for conference services that feature security protocols such as unique and expiring passcodes, data encryption, pre-conference rooms, participant verification, and dial-out capabilities. Operator Assistance – Handling a large number of participants can be difficult when you’re not used to it. In such cases, hiring operators who can provide speaker training, expert troubleshooting, and dedicated support is ideal. Expert operators can help you start the call, greet participants, and screen them before they enter the live call to avoid any mishaps from happening. International Access – If you’re planning on holding a meeting with participants residing in other countries (eg. 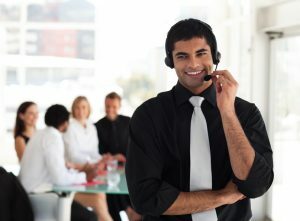 remote employees), make sure that your conference call service can provide international long-distance numbers. By doing so, you can further your reach globally. Additional User Features – To fully take advantage of large conference calls, you should choose a provider that includes bonus features such as a mute option for specific participants, call registration, transcription services, recording and replay, etc. Having these features can help in preventing interruptions from happening and give hosts the opportunity to review a call whenever they want. Features that allow you to get feedback through surveys is beneficial as well. Large conference calls can definitely help you stay on top of your business provided that you have the right large conference call provider. By acquiring the necessary features, your company can gain an extra boost that could help them stay ahead of competition.